Mickey Herskowitz visits with Lu Ellen Gibbs after his President's Speaker Series presentation. The President's Speaker Series was created in January 2002 by James F. Gaertner, SHSU president, and is supported by a grant from Gibbs. Previous speakers have included Gene Stallings, Debbie Fields, Dave Dravecky, David Robinson and James Haley. Famed sports columnist Red Smith called Mickey Herskowitz "one of the wittiest writers alive," and Tuesday morning at Sam Houston State University's Killinger Auditorium, he showed exactly where that came from. Over the years, Herskowitz has worked with notable sports figures such as Mickey Mantle, Muhammad Ali, Bear Bryant and Tom Kite. Herskowitz taught at Sam Houston State Teachers College in the 1960s, but on Tuesday, he made his return to the campus to make a presentation for the President's Speaker Series. He gained notoriety early in his career when, at the age of 26, he became the youngest sports editor at a major newspaper. 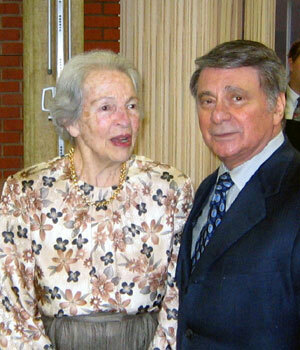 In 1984, Herskowitz was inducted into the Houston Chamber of Commerce. With all he has been through, Herskowitz came back to Huntsville prepared with advice for the SHSU students. Most of the advice he gave involved items that he learned himself, while working in the world of sports.
" I've learned among many, many, many other things from sports," Herskowitz said. "There's a system of values, most of them good. One is the value of confidence, without which, success is almost impossible. You must have confidence, even if you have to fake it." Herskowitz found out all about faking it right from the start of his journalism career. When he was working as a sports writer for the Houston Post, he was covering Texas A&M football. When Bear Bryant was coaching at Alabama, one of his favorite assistant coaches, Gene Stallings, left to accept a head coaching position with the Aggies. Herskowitz called Bryant, who was in New York for the Heisman Trophy presentation, and Bryant said he was happy for his assistant and thought that he would do really well as a head coach. Herskowitz knew that wasn't how Bryant really felt. A few months later, he ran into a writer in Boston he knew who told Herskowitz that he went to interview Bryant the night he found out that Stallings was leaving and the legendary coach had tears in his eyes. Herskowitz recalled fondly one instance where he was sitting next to Ali on an airplane. When the plane was still grounded, the two were talking back and forth, but before too long, a flight attendant came by and told them to buckle their seat belts. Herskowitz buckled his, but Ali jokingly told the flight attendant as she walked by, "Superman don't need no seat belts." Without missing a beat, she shot back, "Well, Superman don't need no airplane." One of Herskowitz's favorite figures to work with was Hall of Fame pitcher Nolan Ryan, but his favorite Ryan story actually centers around someone named Cesar Geronimo. Geronimo was playing for the Cincinnati Reds when Ryan pitched with the Astros, and half of his notoriety came from being the victim of Ryan's 3,000th strikeout. The other half came five years earlier, when he was the victim of Hall of Famer Bob Gibson's 3,000th strikeout. The situation surprised Herskowitz, because despite Ryan's achievement that night, the spotlight shined brightly on Geronimo.
" I know most of us feel that way. We know our life is going really well, when we're at the right place at the right time." For Herskowitz, the right place and right time happened when he was 8 years old. It was then that he decided that he wanted to make his living as a writer. His decision was helped when he found out that as a sports writer, he could get into games for free. But before he got to that point, Herskowitz was encouraged as a writer by his second-grade teacher.
" When you find whatever it is that fulfills you, I think that the chances are very strong that you will look back and realize that along the way a teacher, or perhaps several, inspired you, or hounded you, into tapping all of your potential." Herskowitz said he loves sports because it's a reflection of the society around us. Changes take place, and the people who are successful are those who adapt to those changes.
" For most of us, I think sports is a reflection of the world around us, where the only constant is change," he said. "Times change, people change and societies and nations change." " It's all right to change. You can't grow without change. It's all right to have doubts and uncertainties and having the right to fail. Because having the right to fail is what counts, not failing." Matt Pederson can be reached by e-mail or at 936.295-5407 ext. 3023.